I really enjoyed my lessons with Steve, he stays calm and puts you at ease and is extremely patient and knowledgeable. 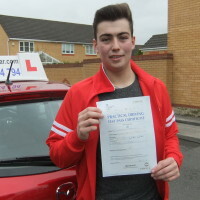 I was impressed with his professionalism and I revised his ‘show me’, ‘tell me’, 2 sided A4 sheet before my test which I found very useful as I didn’t want to start my test with any silly minors by failing the questions before I had even started driving! Steve was very flexible with test dates and I passed within 4 months of starting to learn with In-2-Gear. Steve is very generous with his time, never late and always gives more time at the end of a lesson for feedback, which I was grateful for. Overall, Steve is a very reliable (he never changed a lesson and always turned up when he said he would) driving instructor that I would highly recommend. Thanks Steve for all your help and support.